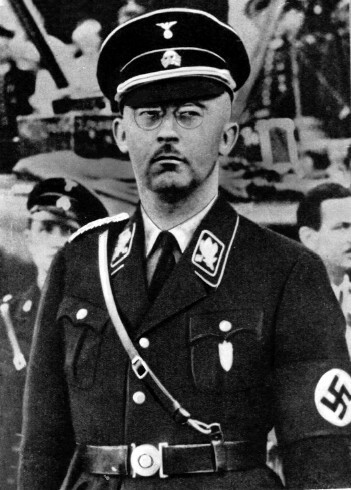 Himmler, Heinrich, b 7 October 1900 in Munich, d 23 May 1945 in Lüneburg, Germany. Nazi politician, chief of the Gestapo and later of the entire German police, and from 1943 minister of the interior. More than any other Nazi leader, he was responsible for the atrocities perpetrated by the Nazi regime. A fanatic enemy of the Slavs, in 1939 he was appointed Reichsführer to consolidate and extend German territory in the east. Denying the Ukrainian people any rights, he conceived the plan to resettle them in Asia near and beyond the Caspian Sea and to settle Germans in Ukraine after the Second World War. When, towards the end of the war, the Ukrainian National Committee was being formed, he advocated that non-Russian anti-Soviet forces be placed under the command of Andrei Vlasov. In the final hour Himmler betrayed Adolf Hitler and, avoiding arrest, was captured by the Western allies. He committed suicide by taking poison.